When a person requires renovations to accommodate their mobility needs, it’s essential to create a home for their safety, comfort, and convenience. Some of the adaptations helpful to these individuals are wheelchair accessible doorways, ramps, and pathways. Lowered cabinets, readily reachable switches, and modified storage are also beneficial. But, the room which is most often in need of renovations to accommodate a restriction of mobility is the bathroom. As bathrooms have evolved from being places of function into places of comfort and relaxation, engineers and designers have more readily created spaces which fit a wider range of needs, including those of the less mobile. At the outset of renovations of the bathroom, the structure of the existing bathroom and home has to be taken into consideration to make sure there is enough available space before remodeling can proceed. The most asked-about bathroom remodeling addition is the floor level, walk-in tub. Walk-in bathtubs have vastly improved since the original ‘walk-in, inward opening door’ models. For individuals who can balance while standing, but lack the capacity to climb into a regular bathtub, this original low-threshold option was the first of many solutions which now exist for bathers with mobility issues. An oft-overlooked segment of physically limited individuals is those who cannot stand at all such as those with spinal cord injuries. For those and others who are wheelchair-bound and don’t have the option of balancing while upright, there are now seated version models with outward swinging doors, which allow the bather to slide laterally onto a seat in the bathtub. This model is also floor level and has an outward-swinging door, which makes it easy to transfer the bather from the wheelchair to the bath without a lift. Beyond these two options are various styles which include lying-down models, square and extended ledge versions. There is a raised bathtub for those who require the assistance of a caregiver. Some models include a quick-draining feature. Another contains a mobile seat option, which lifts, turns, and lowers the bather into the bath. Regardless of which of these options suit the needs of the bather, safety, convenience, and comfort should all play a role in the selection process, since forgoing any of these would produce a less-than-satisfactory outcome. None of these bathtubs require a mechanical lift to operate, which means they can be installed in bathrooms without the need for the additional space necessary to accommodate a lift alongside a suitable bathtub. If a bather doesn’t have respiratory or ear problems, or they can be managed by using a handheld shower nozzle, a floor level shower with a fold-up bench seat is another option. Careful consideration of each option and some planning with the contractor will assure that the remodel results in a bathroom which contributes to the comfort, privacy, and independence of the individual. 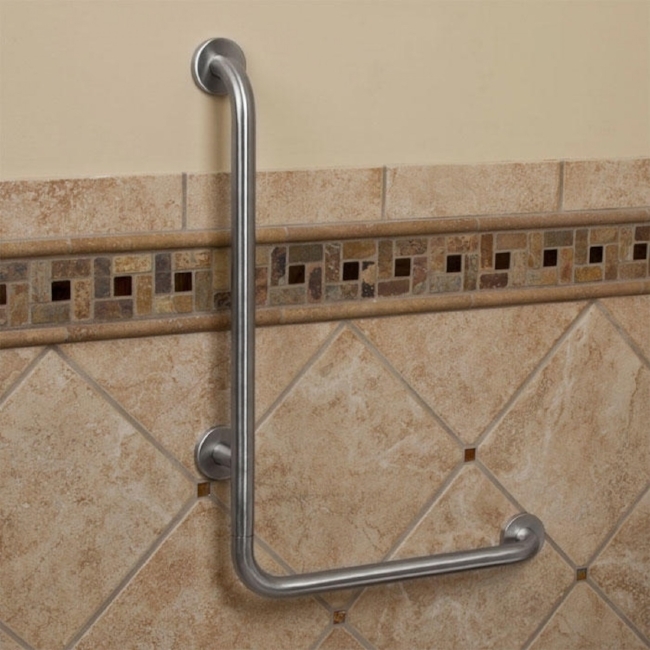 Options for the disabled in the bathroom should address the needs of the person who lives in the home, rather than just a one-size-fits-most solution.